Today it is hard to imagine that one day their was a vast number of black people in Argentina. During the 18th and 19th centuries, in some provinces, like Santiago del Estero and Catamarca, even half of the population were of black slaves. In 1810 in Buenos Aires the almost 10,000 blacks (about 1/3th of the popation) lived in Montserat which at that time was called the ‘barrio del tambor’. They have had a huge influence on the Argentine culture as we know it today. Isn’t tango originally a slave dance? Today, studies say that only about 3% of the population are descendants of these ex-slaves coming from Africa. So what happened to them? First of all the percentage blacks diminished because of the huge immigration wave coming from Europe in the 2nd half of the 19th century. Besides that they were also used as foot soldiers in the war against Paraguay (1865-1870) where a lot got killed. And thirdly the yellow fever epidemic in 1870 wiped out another big amount. It was already in 1887 that only 1,8% of the population was black. There is at least one little place that testifies their existence, and that is in Chascomus. There they also had ‘barrio del tambor’, where the blacks lived. It was close the old castle. In 1861 the black community asked the municipally for a piece of land where they could build a house to perform their African religious rituals and store the festival artefacts. They never called it a ‘chapel’. They were given this piece of land next to the lake where they build this house. In 1868 during the epidemic of cholera, and in 1871 the one of yellow fever, it was used as hospital to nurse the dying blacks. In time it was converted into a place where Catholics went to pray. As it is not recognised by the Catholic Church there are no church services given. Today it is still a very modest and simple place that can hardly be called a chapel. It has a mud floor; the walls are full of images of saints and rosaries. On the chimneys and where ever there is room stand little statues representing different saints. There is a very peculiar atmosphere in this little chapel. There always seems to be someone praying, or at least someone had just been there and let the candles burn. it is quiet and serene. It is a ideal place to pray. An unusual one. La capilla de los negros, Chascomus (km 115 ruta 2), esquina Lamadrid and Venezuela. Declared historical monument in 1962. It always amazes me how so many Argentines know, and agree, that the best medialunas in Argentina are the ones at Atalaya in Chascomús. One only needs to mention the name of the town “Chascomús” and they will reply “the best medialunas!”. And they are right. Of course, one should not expect the same taste their French brothers and sisters, but then they are not called “croissants”, but “medialunas”. They are sweeter and softer then the French ones. Where as the croissant is (in my opinion) best with a bit of (real) butter on it, a medialuna (especially the ones at Atalaya) don’t ask for anything. They are perfect the way they are. Although I certainly can’t resist one with ham and cheese in them. 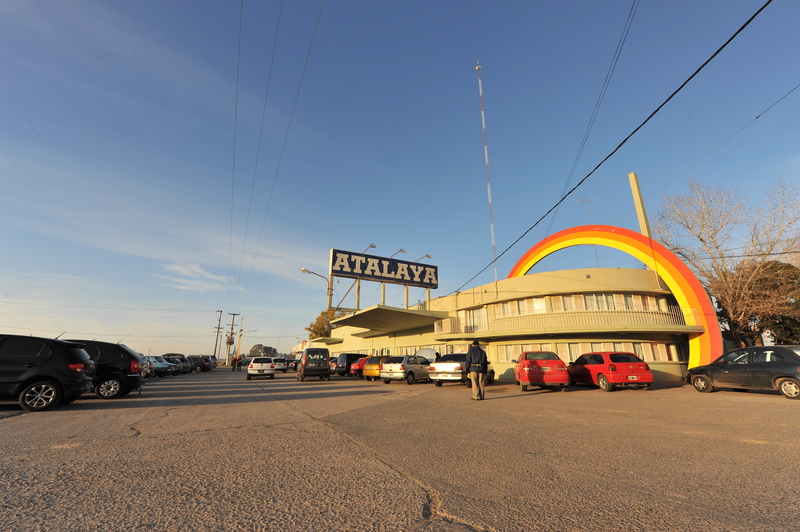 The turnover at Atalaya is so big, that the medialunas always come straight out of the oven and are still warm. At the beginning and the end of an extended weekend, or during holidays, there are huge lines, as everyone driving to the coast does not want to pass this place without buying some. That is what you should do. If you don’t feel like driving 100km south just to buy these delicacies, make sure you stop by whenever you drive to the coast. The biggest one is at km 113 on ruta 2, there is another one by the lake at Chascomús and one in Mar del Plata. Also try the palmeras (I prefer them heated up a bit in the oven), and the empanadas. Don’t let the big crowds scare you off, the service is quick, and they are worth it! 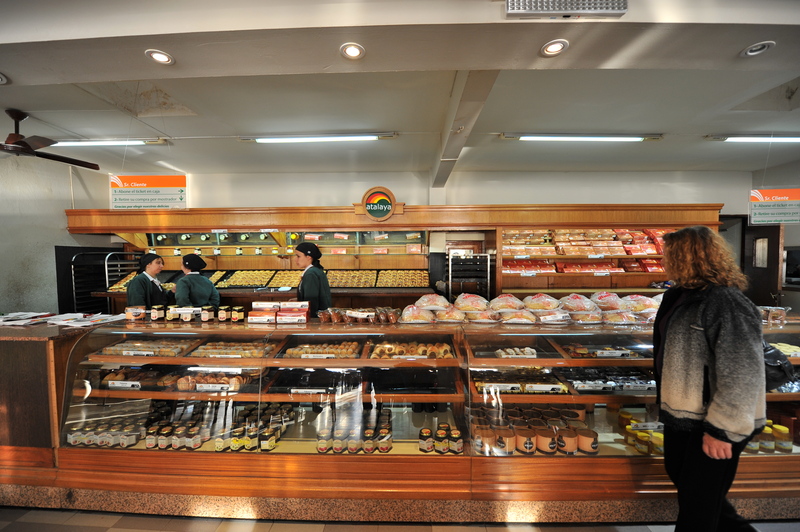 If medialunas are not quite your taste, and you prefer the croissants, I still think the best ones are found here. Sometimes when you see movement at the side of the street you just have to turn off and see what is happening. That is how we came to this “Fiesta Criolla”. Just make sure you always have your camera at hand…! A field full of trucks, people sitting around tables as if they were camping. Little boys running in between the crowd, dressed as mini-men, showing off on their horses as if they are real rodeo riders. Not really “as if”, they are so good that it looks as if they were born on a horse. All the men dressed up in their best gaucho outfit. Including the silver (usually family-) knife stuck on their back in a belt. Hats, boots or botas de potra. You get it. It was defenitely a men’s day. The women all looked very plain, as if they knew that on a day like this the men had to shine and they didn’t want to divert attention. And the men shone! It took me a while before I dared to go to these great looking men asking of I could take their picture, but when I got the hang of it my husband had to pull me away to go home. I just couldn’t decide which man looked the best. In the center there is a big field where 3 horses at a time are prepared for jineteada. Jineteada is this game where a gaucho (can be compared to a US “cowboy”) has to sit on a wild horse as long as 14 seconds. After that 2 other men help him off the horse while riding. Somtimes they fall off, but mostly they don’t. It is extremely spectacular. The horses are quite wild. Four to five men -one of them sitting on a big horse- are needed to prepare the horse for the ride. They treat him as if he is made of glass. They blindfold him to calm him down. It is not until the gaucho is ready to go that they uncover his eyes. And then it starts. In between the rides an old gaucho sings gaucho songs in a melancholy voice with lyrics that are improvised at the moment and are related to the gaucho that had just finished riding. Hours later I still heard his voice singing.